MarsEdit 4.3 is now available from our web site and on the Mac App Store. First up, this release addresses a number of issues affecting the upload of GIF images. Chief among them: animated GIF images can now be resized without losing animation! Second, a significant revision to MarsEdit’s Media Manager should improve its appearance for folks who are running in macOS Mojave’s Dark Mode. We added Dark Mode support in MarsEdit 4.2, but the Media Manager still had some rough edges. Custom fields are a powerful feature of many WordPress blogs. You can add custom fields to support specific behaviors that are not supported by default. You might add custom fields to support plugins that do SEO optimization, associate custom downloadable data with a post, or to control some other feature of a custom theme or plugin. 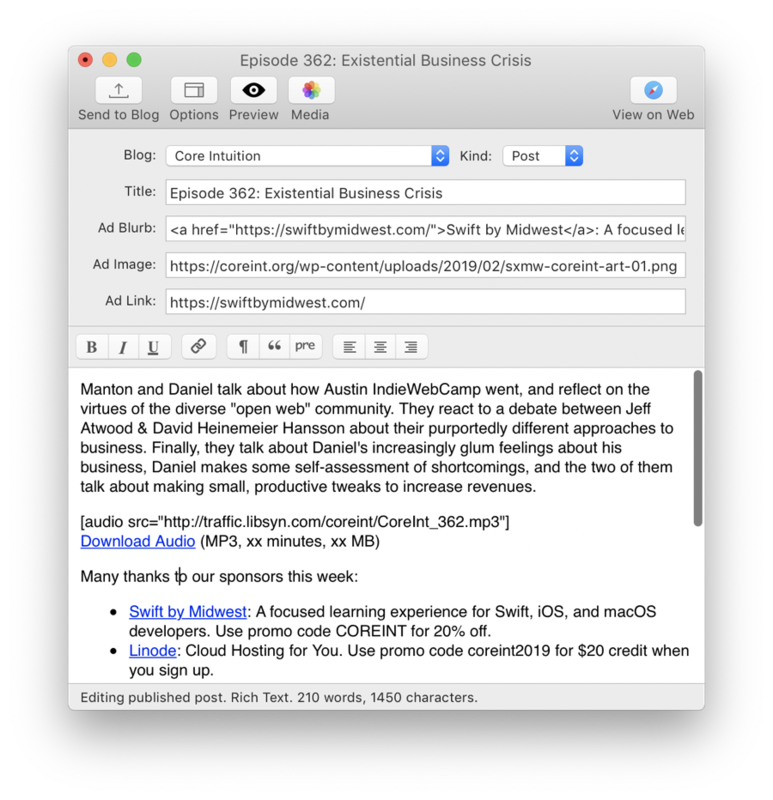 On the Core Intuition Podcast, we use Custom Fields to support the listing of sponsor information on the show’s web pages. When a specific episode is being shown, a custom WordPress plugin looks up information about the episode’s sponsor, and adds suitable content to the sidebar for the page. You can type whatever you want for the “MarsEdit Label”, as it only affects how MarsEdit will identify the field in post editor window. The important part is the “Server Custom Field Name” which must match whatever the field’s name is in your WordPress admin panel. I just type or paste in the suitable values for the show’s sponsor, and everything else is taken care of for me automatically. MarsEdit is great for setting up streamlined publishing workflows. 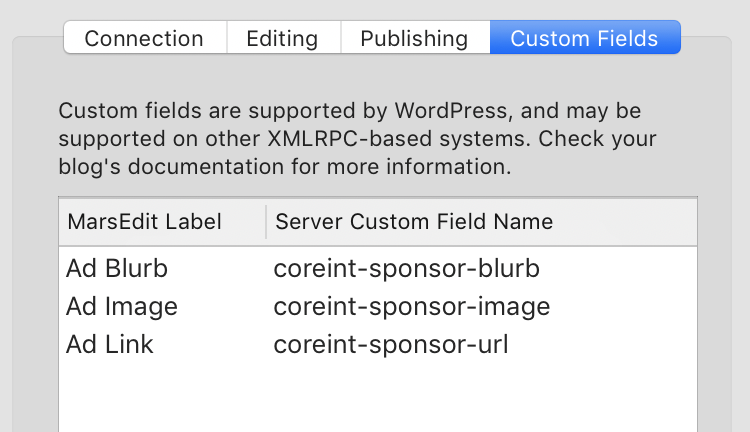 If you’re using WordPress Custom Fields, you can use this one-time configuration change in MarsEdit to make it easier than ever to add custom field values to your posts. Raise your hand if you, or somebody you love, still presses Command-S constantly while editing text, or really, working with any content in any app on your Mac. Those of us who have been using computers for a long time remember a day when, if you didn’t remember to save, then you might lose everything. These days most apps, including apps such as our own MarsEdit and Black Ink, support some form of autosave, making this old-fashioned habit unneccessary, yet harmless. Some apps, such as Apple’s Notes, have gone so far as to remove the save command. This is good in the sense that it simplifies the app, but bad in the sense that users who aren’t familiar with autosave may not know their work is saved. It’s also bad for compulsive Command-S savers, because every time we press the keystroke, we’re greeted with a loud BEEP! from the computer. Thanks for nothing. 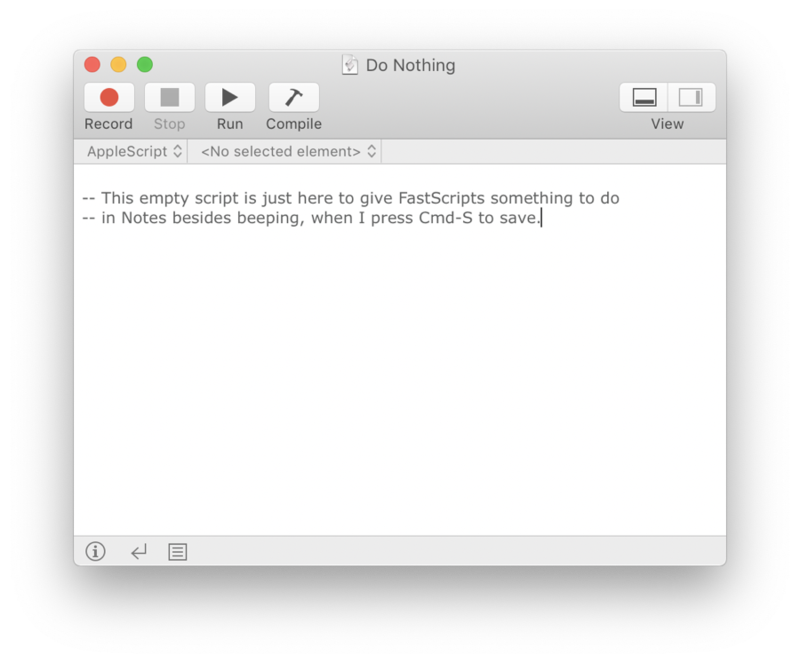 One of Red Sweater’s apps, FastScripts, offers an elegant solution for quieting the beep that occurs in Notes, or in any other app for that matter, when Command-S is not wired up to any menu item. 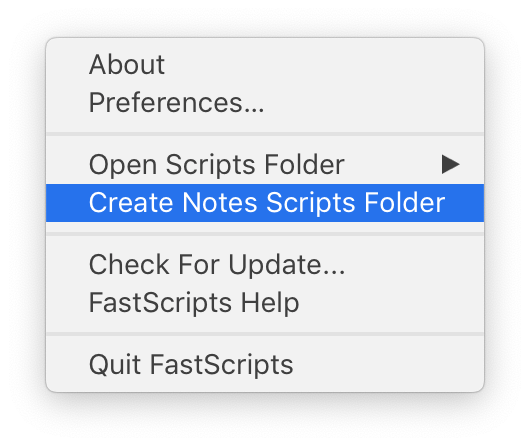 Because FastScripts can be used to override just about any keystroke, you can configure it to run a script in Notes when Command-S is pressed. The script? It does nothing. Thanks for nothing, indeed. Download FastScripts. It’s completely free for up to 10 keyboard shortcuts. Open Notes on your Mac. This is the folder in which we’ll create and save a “Do Nothing” script for Notes. Open Apple’s Script Editor from the Utilities subfolder of your Mac’s Applications folder. Save the script and move it to the “Notes” folder you just created in the Finder. Switch back to Notes, where we’ll assign a shortcut for the script. Ah, the sweet silence of Command-S in Notes has never … not sounded … so good? These steps may sound laborious, but you’ll quickly get the hang of it. Creating a such a script takes only a minute or so when you’re familiar with FastScripts and the Script Editor. You can use the same technique with any other app on your Mac that behaves in an unwanted manner when you compulsively press Command-S, or (almost) any other key, for that matter! FastScripts 2.7.6 is now available for download from the FastScripts home page and on the Mac App Store. Since macOS Mojave 10.14 shipped, many folks have noticed the increase in “permission requests” when an app wants to access something like your Photos, Calendar, Contacts, etc. FastScripts doesn’t itself ask for permission to access the data from these apps, but the permission prompts appear when some script that a user runs itself attempts to obtain data from the protected apps. At some point along the way I think Apple tightened things up so that the permission prompt is not even displayed if the host app (FastScripts, in this case) doesn’t include a ‘usage description’, which explains to the user why it wants access. In FastScripts’s case, the explanation is always just some form of “because you are running a script that does this”, but nonetheless, I think I need to include these strings in order to support scripting these privacy-guarded assets. Add usage explanation strings for requests via scripts to access Reminders, Photos, and Calendar information. This fixes a problem where scripts that attempted to automate these apps wouldn’t prompt for user permission to do so. 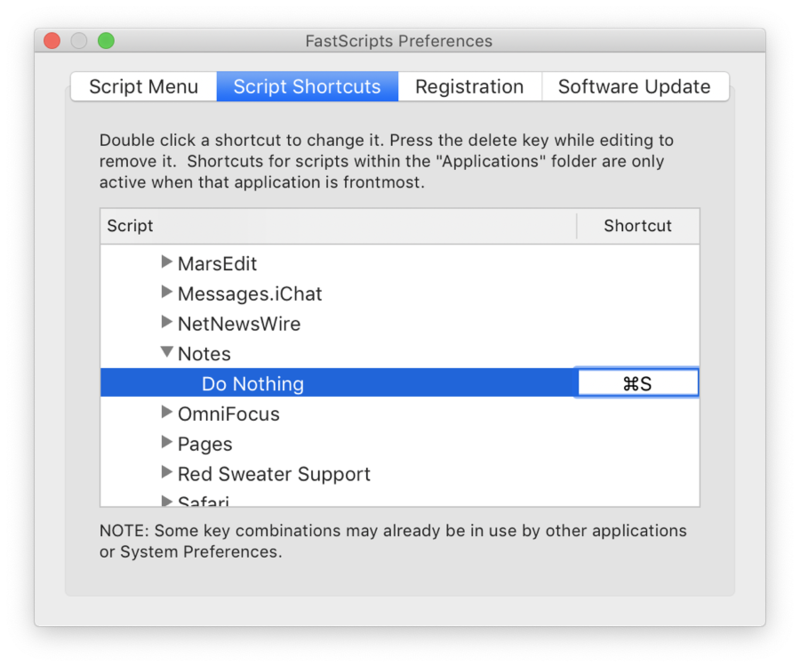 If you enjoy FastScripts, please consider writing a review or rating the app on the Mac App Store, or spreading the word on Facebook or Twitter! Thanks for your support. Questions or concerns? Get in touch at support@red-sweater.com. Thank you. MarsEdit 4.2.6 is now available at the MarsEdit home page and on the Mac App Store. This update restores the ability to upload images to Google’s Blogger/Blogspot blogs. As luck would have it, when I released 4.2.5 on Tuesday, it happened to coincide with the very day Google shut down its interface for 3rd party apps that use its Picasa Web Albums API. They are now requiring all apps to use the Google Photos API instead. It’s going to take a little time to shift MarsEdit to the newer API, but luckily Google provided a bit of a safety valve, allowing apps like MarsEdit to continue using the Picasa API for a couple more months while we make the transition. It just required a minor change to the app to “enable” the workaround. MarsEdit 4.2.5 is now available at the MarsEdit home page and on the Mac App Store. This update fixes a bug, introduced in MarsEdit 4.2.4, that stopped tab and shift-tab keystrokes from changing the nesting level of bulleted and numbered lists in Rich Text mode. It also fixes a couple crashing bugs, and improves the reliability of MarsEdit’s authentication (login) mechanism for some WordPress and AtomPub based blogs. MarsEdit 4.2.4 is now available at the MarsEdit home page and on the Mac App Store. MarsEdit 4.2.3 is now available at the MarsEdit home page and on the Mac App Store. This update addresses a few bugs, including one that caused copy-and-pasted images on Macs with Retina (high resolution) displays to be downgraded upon pasting into a lower-resolution image. For example, a screenshot capture taken at 400×400 pixels would be pasted in MarsEdit as a 200×200 image. I also addressed a minor, but annoying issue when editing posts that contain “blocks” added by WordPress 5.0’s new Gutenberg editor. In MarsEdit 4.2.2 and earlier, editing these posts in MarsEdit’s Rich Text editor would cause additional, blank paragraphs to appear between the WordPress blocks. It’s been about two years since the last update to Touché, our free utility for running Apple’s Touch Bar interface even on Macs that don’t have a hardware Touch Bar. I don’t actually use Touché much myself, but I get a good amount of feedback from folks who appreciate having it around. I actually used it the other day on my MacBook Pro, even though it has a Touch Bar: I was using an external keyboard and didn’t want to reach up to touch the real touch bar!